NTC’s Basic Japanese, Level 1 (William) encourages your students to use Japanese from the beginning as they learn to talk about themselves and the world around them. Hiragana and katakana are gradually introduced and a number of kanji are introduced for recognition only. 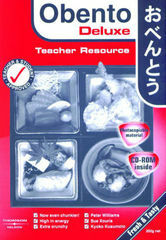 Useful reference includes a vocabulary checklist, a kanji checklist, and complete hiragana and katakana charts. NTC’s Basic Japanese, Level 2 (William) extends students’ speaking, listening, reading, and writing skills. Through open-ended exercises, students learn to express their thoughts and opinions in Japanese. Hiragana and katakana are continually reviewed to help your students master the syllabaries gradually and completely. This text is hardcover, 7½” × 10”, and 160 pages in length. Nakama 1 is a complete, flexible introductory program designed to present the fundamentals of the Japanese language to college students. Presented in two parts, Nakama 1a and Nakama 1b, the program focuses on proficiency-based language learning, emphasizes practical communication and student interaction, and fosters the development of all four language skills and cultural awareness. Thematically organized chapters focus on high-frequency communicative situations and introduce students to the Japanese language and its three writing systems: hiragana, katakana, and kanji. Maintaining the program’s balanced approach, the new edition features updated technology resources, new authentic art, and practical, contemporary vocabulary to enhance both teaching and learning. My First Japanese Kanji Book is an inventive and unique introduction to kanji for children. Written by the mother-daughter team of Eriko and Anna Sato, this lovely book introduces 109 kanji characters to children with poems and illustrations. It includes all the Japanese Government specified first grade level kanji characters and a sprinkling of simple second to sixth grade characters. The kanji are introduced in the context of 36 colorful paintings and poems by 14-year-old Anna Sato, herself a kanji learner. Each of the poems is presented in both Japanese and English, and all kanji are accompanied by furigana (small hiragana letters), stroke-order diagrams, sample vocabulary and boxes for writing practice. A charming and educational volume, My First Japanese Kanji Book can be used as a self-study text, a supplementary material in Japanese language schools or a gift book for family or friends. A kanji textbook using various devices to introduce kanji to the beginner in an enjoyable and effective way. By covering the kanji words found in the Main Textbook, and assisting the learner with comprehending the structure of kanji, the burden on the learner is greatly reduced. The 220 target kanji have been selected from Minna no Nihongo I , and the 298 target kanji in book two have been selected from Minna no Nihongo II..